With over ten years experience designing and illustrating books for the Australian publishing industry, Dr Zoë Sadokierski's research focuses on the future of books and publication design in a digital age. She investigates the relationship between content (word and image) and its material form (printed on the page, or digitised on screen). 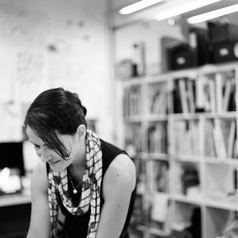 Zoë also runs workshops on reflective writing as a tool for design practice, and the importance of working off-screen in the concept development stages of design projects. She is also the current president of the Australian Book Designers Association.